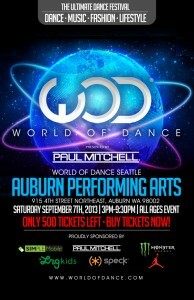 The Countdown to World of Dance Seattle is underway. I am posting videos of acts that will perform in the 2013 show. Seattle!!! Be Ready to Get Loud at #WODSeattle! september 6th - 1 day until showtime! Featured headliners! 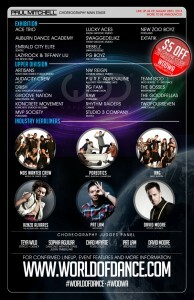 Mos Wanted Crew is A clan of Choreographers to rep not just as individuals or as a crew but to REP OUR COMMUNITY. Created nearly over a year ago by the Co-Founder of World of Dance Tour, Myron Marten with the great help from his close friend Jun Quemado, They hand picked a set of good friends that are very well involved with the dance community locally and internationally and wanted to come together as a crew to represent where they started from, raised from and give respects to where they are now as blessed dancers and hopefully to achieve more accomplishments in dance. They are not here to represent as individuals but to show they haven’t forgotten where they come from and that is our COMMUNITY. The wanted to show that from what ever your history or background maybe, someway, somehow theres always an opportunity to be a star or a celebrity in your onw to be a role model and influence the future of our community. The name Mos Wanted is not to show that we are the Best of the Best or never will ever claim that, but to point out this is WHAT WE WANT MOS in life. Dance is the passion for Mos Wanted, just like 1000s of dancers feel the same way around the world. We are very humbled and blessed for the opportunity to create a new brotherhood of dance, as we look at each other as our own inspirations and role models in this community. Poreotics, also known as Poreotix, is an Asian American all-male dance crew from Westminster, California. The crew was formed in 2007 by Matthew "Dumbo" Nguyen and specializes in popping, choreography and robotics, hence the name Po-reo-tics. They have performed in numerous hip hop dance competitions, most notably coming in 1st place in the USA division of the 2009 and 2010 Hip-Hop Internationals and in other dance programs and competitions including the Vibe 15, FUSION X, Body Rock, and World Of Dance. On April 8, 2010, they were crowned the champions on the fifth season of America's Best Dance Crew. On January 14, 2011 they were crowned as Team of the Year at the World of Dance awards. They are known for their shades, dark glasses which they wear for all of their performances. Jet Li stated that they wear the shades because it gives them character. All of them are of Southeast Asian heritage. Matthew "Dumbo" Nguyen, Can Trong "Candy" Nguyen, and Charles Viet Nguyen are Vietnamese while Andrew-Chad Fausto Mayate, Lawrence "Law" Bravo Devera, and Justin "Jet Li" Valles are Filipino. RNG: Rated Next Generation is a hip hop crew based out of The Connection Performing Arts Center in Mukilteo, Washington. RNG was formed in May of 2009 by director and choreographer Kolanie Marks with the express purpose of competing at Hip Hop International. After 6 weeks of training, the crew placed 1st in the USA and 6th in the world. the crew is currently made up of 7 young dancers ranging in age from 13-15, all from the Puget Sound area and under the continued direction of Kolanie Marks they are gaining national attention for their unique style and the precision and versatility with which they execute their performances. RNG’s mission is to make a lasting impact on kids who are inspired by us and have, in turn, inspired us. We believe that with commitment and dedication to following your passion, and believing in yourself and your loved ones, you can realize your dreams and inspire other people to do the same along the way! RNG believes that success is only success if shared and is dedicated to giving back to our community. september 5th - 2 days until showtime! september 4th - 3 days until showtime! September 3rd - 4 days until showtime!